Taking a bath is one of my favourite ways to relax and unwind before bed either after a long day at work or a busy weekend. A quick two minute shower is sometimes necessary in the mornings but if I can make the time to take a bath, I will. I thought I'd start sharing the products I'm loving at the moment and will update as and when I'm using new or different products. Therapie Himalayan Detox Salts // This is a luxury bath product and one I don't use on an everyday basis. Instead I save it for Sunday pampers or nights when I've had trouble sleeping and need to completely relax. A scoop full of the salts in your bath water really does help you sleep better that night. When using them you're meant to not touch anything electric afterwards and just go straight to bed. I don't always do this but more often than not I do try to read a book before bed instead of watching tv. These also smell amazing and manage to fill up the whole room with the scent which I've found some bath salts just don't do. Laura Mercier Almond Coconut Milk Bath Salts & Body Cream // Sticking with bath salts, these from Laura Mercier are also really nice. The almond coconut scent is exactly as you'd imagine and is almost sickly sweet but not quite. I reach for these bath salts when my skin is feeling dry as they really moisturise the water and then I can follow up with the body cream with the same scent. The Body Shop Fig & Rosemary Shower Gel // Although these don't seem to be available online anymore I think you can still buy them in store, at least I hope you can as I need to repurchase this scent! I never would have put fig and rosemary together let alone me actually liking it but I completely fell in love with it. The shower gel is very watery so I always use a shower lily otherwise I feel like I waste a lot of product. Mor Base Grape Candle // You can't have a relaxing bath without lighting a candle and the one I've been burning recently is a bargain find from TKMaxx. Mor is a brand I always hear Fleur talking about but I've never seen it being sold anywhere up until a few months ago when I spotted a lot of the products in TKMaxx. I loved all the different scents but after falling in love with the basil grape hand soap I knew I had to buy the candle as well. It's a very sweet fragrance and the basil in it is very subtle. As far as the candle goes it burns really nicely and the scent fills up the room well. I think I only paid £4 or £5 for it as well and it's a soy candle which doesn't irritate my skin. Your pictures are always so enticing! The Himalayan bath salts have been making an appearance at a lot of blogs! 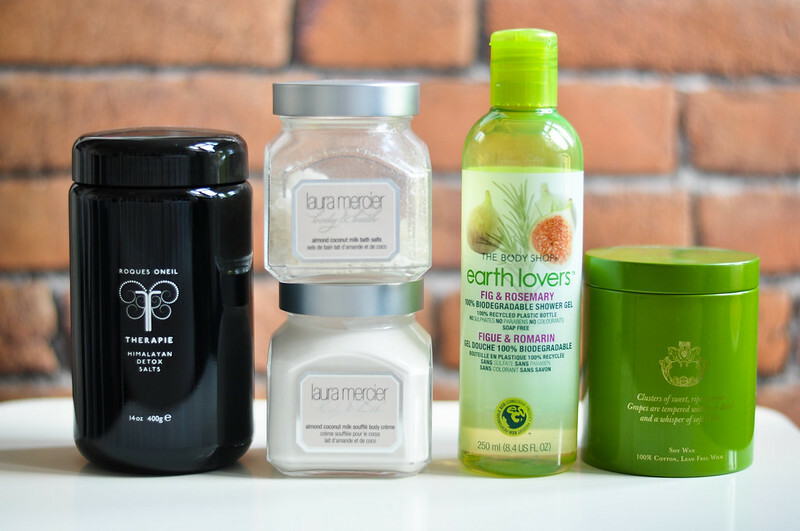 I've wanted to try one of the Laura Mercier salts/moisturizer combinations for such a long a time! I think I have my sights set on the Amber or Honey one. They seem so luxurious!